Travelers landing at Washington DC Reagan National Airport can quickly find many of the locations throughout the airport and to assist them on getting to where they need. Arriving to the nation’s capital can be an overwhelming experience, especially if it’s your first time there. Relax as soon as you arrive to Reagan National Airport, taking in the quaint environment as you prepare for the rigorous world of politics that waits outside. With ample parking, interesting services, and a slue of tasty restaurants, the airport itself is a city that begs to be explored, something that can easily seen by curious minds. If you’re traveling out of DC and need a place to leave your vehicle, enjoy the easy-to-find parking garages. For hourly parking, head to the A Garage, only accessible through the West Entrance and directly connected to Terminal A. 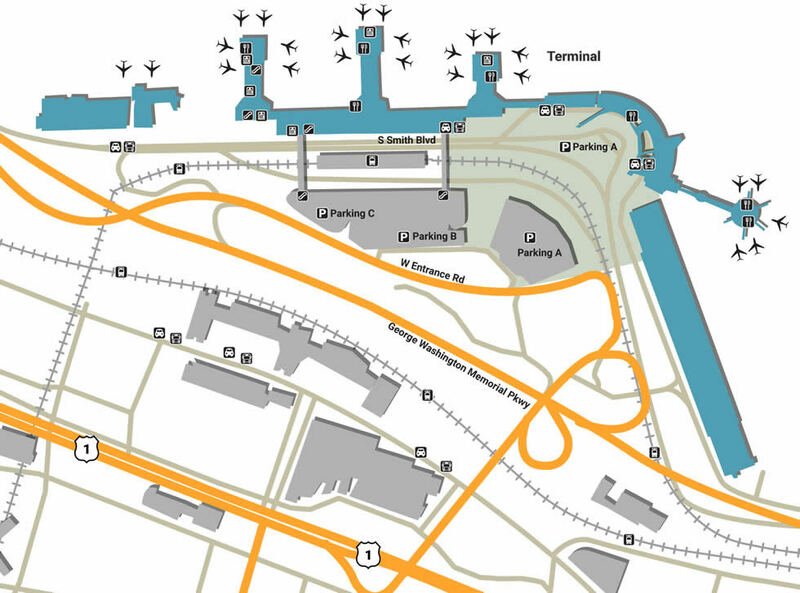 For closer access to Terminals B and C, park at the B/C Garage, which provides quick shuttle service.The Economy Lot offers the lowest fare for weekly as well as daily parking and is located on the Far East side of the airport near the Alexandria exit. The Airports Authority of the DC area have always been interested in keeping the city’s history alive and well through exhibitions, something that can be experienced at Ronald Reagan Airport’s Exhibit Hall. Connecting Terminal A to Terminal B, the museum is the perfect way to kill some time. For professionals, the airport is also the best place for fast meeting, especially if you plan on utilizing the state-of-the-art conference rooms, each one coming fully equipped with LCD Televisions, free WiFi, and catering. If you find yourself stuck with nothing to do, explore Reagan Airport’s National Hall, a shopping strip filled with upscale choices and interesting gift shops. Whether it’s the exemplary hand-stitched wallets at Fine Leather Works or century-old wardrobe expertise of Johnston & Murphy, you’ll be sure to find something that matches your taste. If you’re a news junkie, stop by the Washingtonian for local and international press, or get a relaxing beauty treatment at XpresSpa. There’s tons of food to eat at the National Hall, from classic restaurants to quick-service meals. Eat fresh Mexican at Qdoba, enjoying fresh burritos, bowls, or tacos prepared right in front of you. For something more chic and elegant, grab a table at Sam & Harry’s for the best steak in DC. Enjoy fine aged wine and prime USDA beef while you wait for your flight, looking out at a bright future from a dim eatery. There’s also a Starbucks at pre-security, giving you the opportunity to get a boost before flying.